Beyond These Dark Lands Are Edges Of Joy: The Poet Explains His Poem Freedom, a Poem of Leaving Darkness. The Poet Explains His Poem Freedom, a Poem of Leaving Darkness. Freedom is a poem from my book, Beyond These Dark Lands Are Edges Of Joy, Words of Comfort and Hope. When you read it you start to understand that forgiveness is possible. The full title of this poem is Freedom, a Poem of Leaving Darkness; it suggests freedom will be found when you leave the place of darkness. Darkness may be anything but this poem applies to the specific enslavement of guilt, and the darkness we carry inside. This poem is 27 lines long and most lines are five syllables. At first, it looks like free-verse. It is one of the rare poems in this collection that uses the first person singular of "I. "The I starts a new section of the poem four times. Lines 1 through 6 is the "I see you oppressed..." section, where the poem opens up with the observation of the readers struggle with guilt and darkness. Lines 7-13 are the "I would give freely..." where the poem moves to compassion, but with the suggestion that there is a solution to be received. Lines 14-17 is the "I, too, needed..." and "I have found..." section of confession and admission. The "I have found..." is repeated in line 18, I prefer to avoid repeats because they generally weaken a message. I made the exception to satisfy the question of what was found. The last 9 lines are a declaration of having found freedom from darkness and guilt. The last line of the poem is simple but after you think about you see more than what is on the surface. In these posts, I try not to give away too much since I want to sell the book but here is the ending. I wrote this poem because I know a lot of people struggle with guilt. Guilt is a darkness in our souls that we can't get rid of no matter what we do. I offer the solution that through Christ the Father offers forgiveness because of Christ's sacrifice on our behalf. 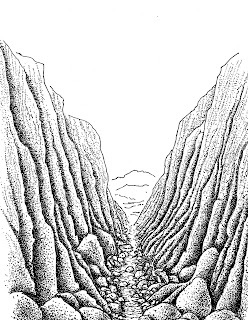 This poem is illustrated with a drawing of a dark deep valley with a rocky path. 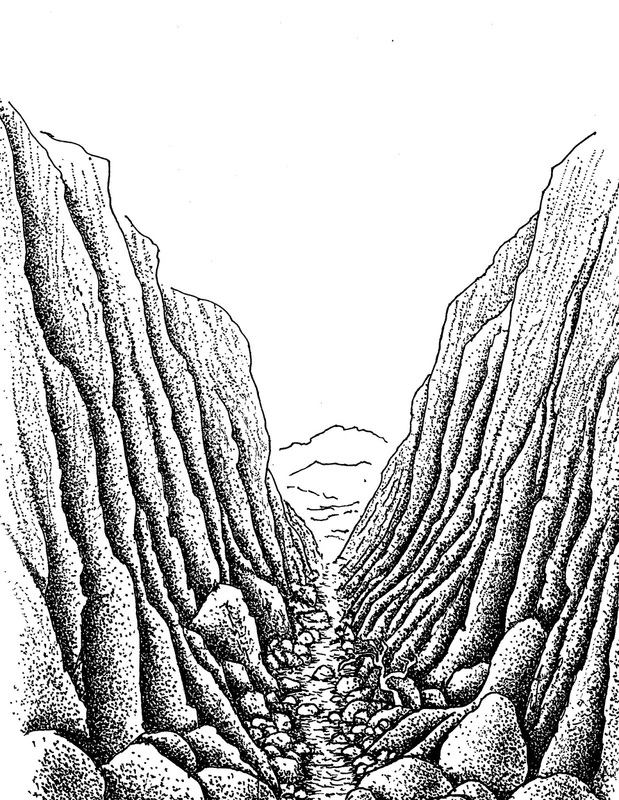 Beyond the valley, the path enters distant pleasant lands. This poem offers hope that if you are struggling with guilt that there is forgiveness for you if you receive it from Christ who gives it freely.